Renewing a commitment to making yourself healthier and happier doesn’t mean you can’t still have a good time when you’re with your friends. You can still enjoy a drink or two without shattering all of the hard work you’ve been doing to improve your physique. All it takes to succeed is finding a few healthy good drink recipes you can trust to be low-calorie, healthy, and delicious. 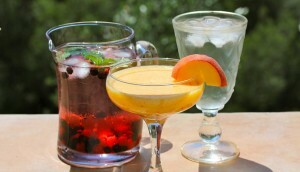 It is easy to make healthy drinks at home. The obvious first step is finding light or lower calorie liquor to use as your base. From there, all you need are some healthy alcohol mixers or some all-natural ingredients that you can use to kick your booze up choice up a notch or two. If you’re a fan of sweet drinks, don’t reach for sugar-laden potions when some freshly squeezed fruit juice will provide natural, healthy sugars. In case that’t not enough sweetness for you, there is a simple syrup recipe you can make quickly at home. Mix up half a tablespoon of honey with just under a tablespoon of water to add a bigger, natural punch to your sugary drinks. For many people, “mixed drink” means alcohol combined with soda. Unfortunately, that means you will get an entire day’s worth of sugar, sodium, and carbonation in only a couple of quick drinks. Sure, you can mix your alcohol with a diet soda to cut calories, but that doesn’t necessarily mean it’s healthy. You can ditch the sodium and post-party bloat if you choose seltzer water over any type of drink with carbonation. You can also cut even more calories by lowering the number of shots you put into that drink. One per drink is likely more than sufficient, and you’ll get fewer calories per drink (and your liquor will last longer too). Finally, for those who think “There’s no way alcohol can be healthy,” just consider some additives that have real, bona-fide nutritional benefits. Add some ginger or lemon to a drink for a tasty treat, or throw in some fresh mint or cut-up fruit in your mojito. There’s no reason to keep indulging in high-calorie drinks when there are so many healthy options available. Try a few and you’ll never drink the same way again.